This is a project I created for my 4th and 5th grade language arts class. We had been learning about story elements and I wanted them to do a project on a book of their choice, outside the old cereal box project. Students read a novel of their choice and then must write about the setting, the plot, pick 5 (or however many) important events, the characters, complete a main character profile and write a summary about the story. 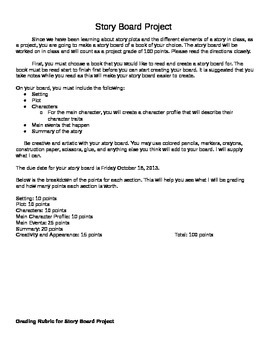 The project is worth 100 points (this can be changed) and a rubric is included for grading.